Socorro 2016 in a Nutshell: Socorro lived up to its reputation as the best big animal destination in North America yet again! 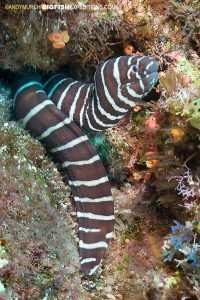 As usual, after a calm overnight crossing to Isla San Benedicto, our first dive day started with a couple of sharky dives at a site called The Canyon. 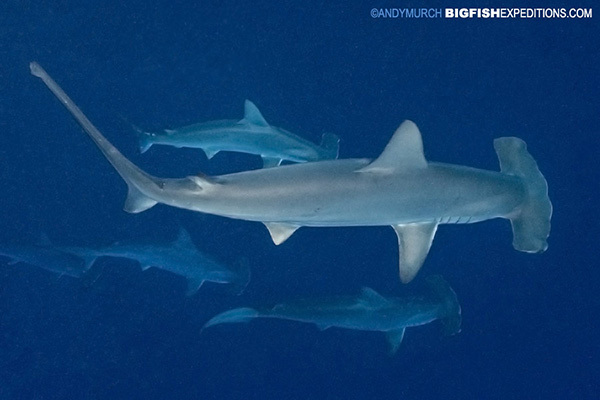 A few hammerheads and Galapagos sharks came in to investigate and there were a handful of whitetips, one curious silvertip and our first giant manta. After the dives, we found some silkies hanging around our ship so we slipped in and shot some great images of them framed against the golden rays of the dying sun. Not a bad start to a week in the Revillagigedo Archipelago. Overnight we sailed to Roca Partida. ‘The Rock’ is a remote pinnacle in the middle of nowhere that is a magnet for pelagic predators. Out of the four dives we conducted that second day, on three we found schooling scalloped hammerheads. All the other shark species were also present plus a few giant mantas. 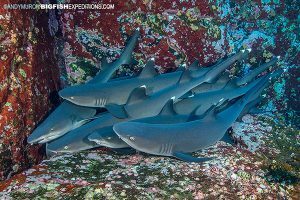 Most of the guests followed the dive master deep into the blue to look for more hammers but I stayed by the pinnacle and played with the reef whitetip sharks that crowd onto tiny ledges carved by the surge into the walls of the rock. 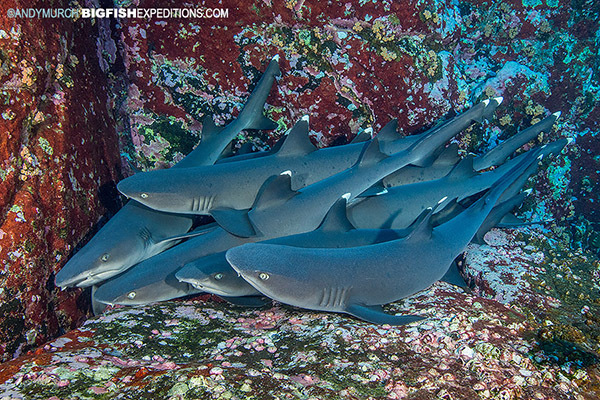 Why the whitetips huddle on the tiny ledges instead of spreading out on the bottom is a mystery. I believe that the relative safety of the shallow ledges probably affords them some protection from the bigger sharks that hunt in the depths. Exposed Roca Partida would not be a god place to get caught in a storm because there is nowhere to hide. Underwater, there is an area on one side that is very slightly concave. In that subtle lea, there is a resident school of bigeye jacks that swirl and weave incessantly in an effort to hold position in that one protected spot. There are also enormous clouds of small snappers and swarms of tiny baitfish. Periodically, gigantic yellowfin tuna race through the multitudes of smaller fishes, picking off the weaklings. This is my favorite place to off-gas before surfacing to rejoin the group. 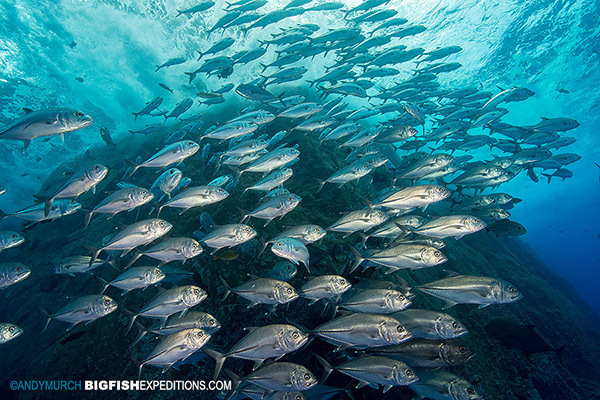 After searching for the big stuff out in the current, I would drift into that fish bowl and float among those mesmerizing jacks, watching each species hunting and avoiding predators. 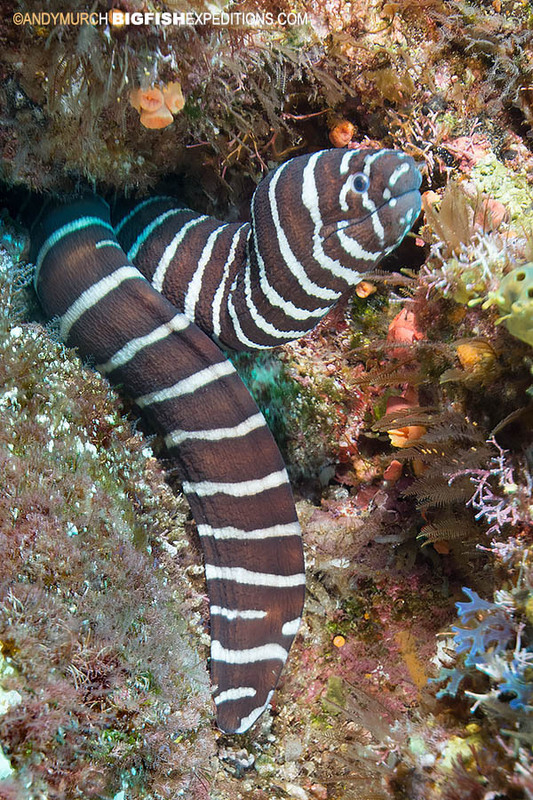 Roca Partida is a very special piece of ocean real estate. 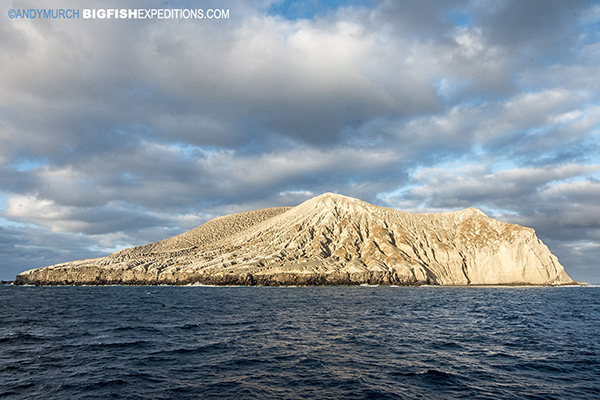 We left Roca Partida that night and awoke at a dive site called Punta Tosca on Socorro Island. The first dive there was fairly uneventful unless you count all the fishes and whitetip sharks. The second turned out to be a lot more entertaining. 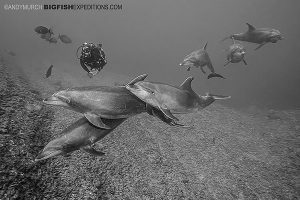 Our group came across three Galapagos sharks that were ripping apart a giant electric ray. As there is no baiting allowed in Socorro, the sharks are usually seen passively swimming around. So, it was quite an eye opener to see them tearing into a the carcass of a ray. One took a big cresent shaped bite out of its pectoral fin and then the other two literally shook it in half. Quite a show for our divers! Later that day we dove Rock Oneil. Unlike most sites in the archipelago that are pinnacles or ridge tops, Rock Oneil is a raised plateau topped with craggy rock outcrops. To me it resembles a ruined castle perched on a waterlogged hilltop. 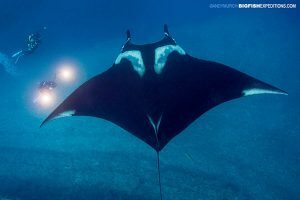 There are caves and swim-throughs filled with fishes, eels, crabs and lobsters and plenty of other marine life to keep people busy while they wait for the first manta to show up. After navigating our way through the swim-throughs and snapping lots of fish portraits, we rose onto the top of the shallow plateau and found a manta to accompany us while we decompressed. After a nice long encounter could have gone on all afternoon, we left the manta behind and returned reluctantly to the chase boat. That evening we relocated to the far side of Isla Socorro and anchored at Cabo Pierce; a rocky ridge top that has two deep manta cleaning stations. 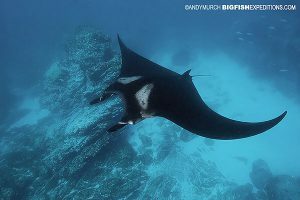 The next morning, as if they had been waiting for us to show up, two enormous mantas rose from the depths to be cleaned as we approached the ridge. I’ve never been disappointed with Cabo Pierce. It seems like there are always one or two mantas that need a manicure from the busy clarion angelfish that work at the cleaning station. I assume this means that there actually must be hundreds of mantas that arrive one by one throughout the day. That night we sailed back to San Benedicto. All week the dive masters had been raving about The Boiler; a famous site for mantas and dolphins. When we plunged in the next morning, the dolphins were there waiting. 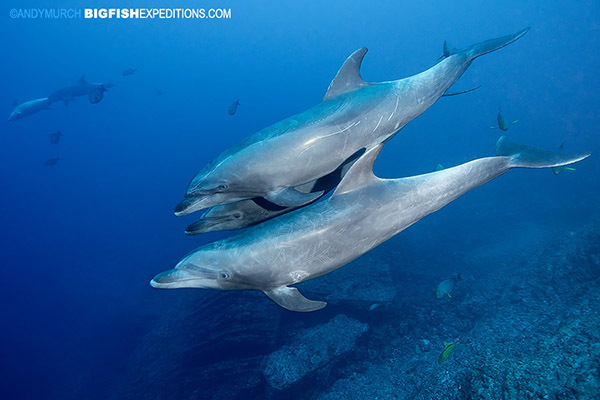 There are lots of places that you can run into dolphins around the world. Most want nothing to do with humans. Some are vaguely curious but quickly leave, and then there are a few spots where the dolphins seem to really enjoy human company. The dolphins in Socorro seem to have a pretty easy life. 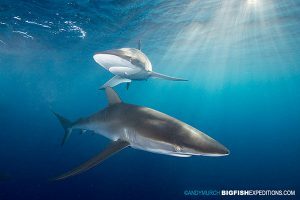 There are plenty of fish to eat and they don’t appear to have many run-ins with predatory sharks. So they have a lot of free time and being intelligent animals, they get bored. I’ve watched them playing ‘patty cake’ (that clapping game that little kids play), I’ve seen them rubbing each other’s fins to make squeaking noises, I’ve seen them chasing jacks just for fun, I’ve seen them playing pass the sea star. So when the humans show up, its not surprising that they swim over to hang out. Its not that we are particularly interesting but there just isn’t much else to do! So we fell in among the dolphins and they stayed with us for the majority of the dives we did that day. 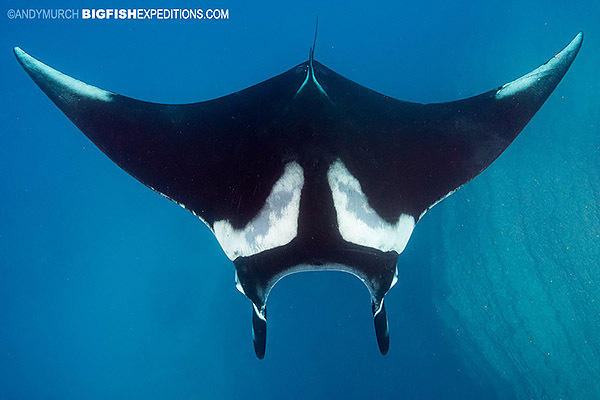 They were so much fun to watch as the raced back and forth through our group that the mantas became almost an afterthought. The mantas also like to hang out with people at the boiler. They seem to really enjoy the sensation of bubbles rolling over their bellies so they returned time after time to the group. The next morning (day six) we snuck in two more dives with the dolphins and mantas before starting the long crossing back to Cabo San Lucas. Another great week of diving in the bag, thousands of images and videos saved to hard drives and many new friendships started. All that was left was a great night out in Cabo and fond fairwells the next morning. I love Socorro. 2017 is already getting full so sign up now if you want to experience this epic destination: 2017 Socorro Diving Adventure.